AAAAHHHH!!! 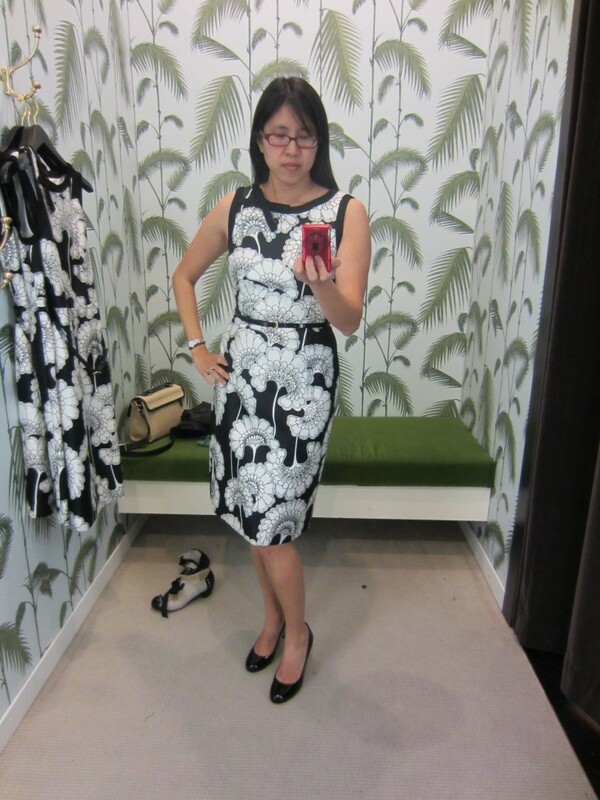 Look at this Kate Spade dress! Should I get it? 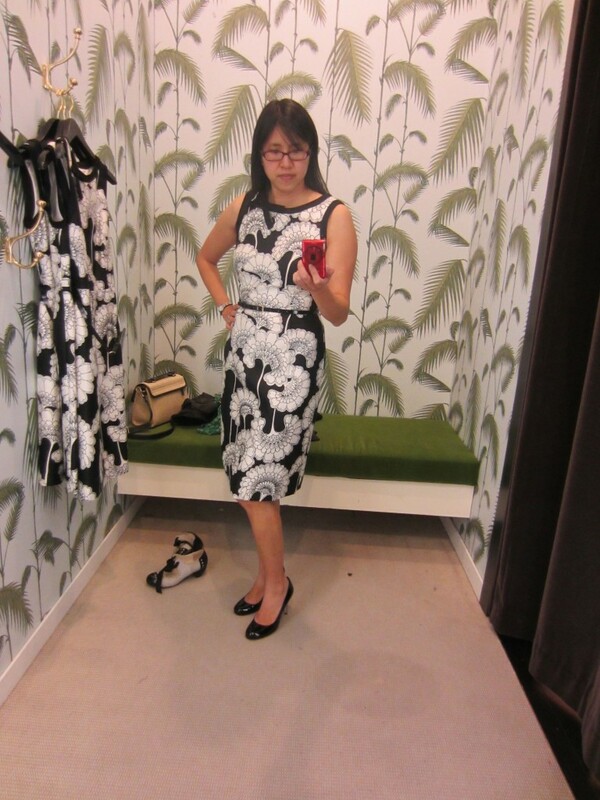 OMG look at this Kate Spade Japanese Floral Austin Dress! I LOVE it, it's so mod and I love the black and white pattern. I could wear it to work, on dates, as a cocktail dress, etc. etc. And I could wear it year round! And it's on sale at Bloomingdales! It's normally $395 but it's on sale right now (till 4/1) at Bloomies for $278 and if you use coupon code FANDF it brings it down to $236! AAAAHHHH!!!! I can't resist! 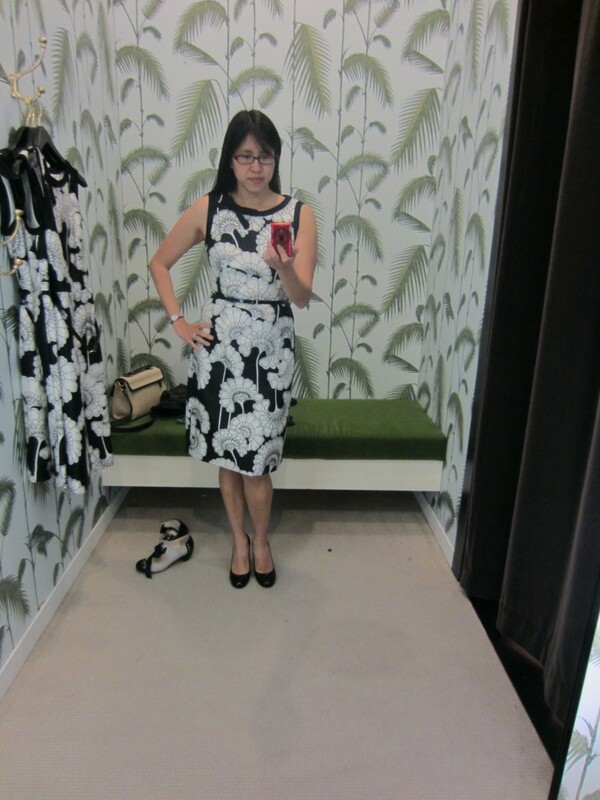 I went to try it on at the Kate Spade shop. The size 6 fit me best (which isn't available online at Bloomingdale's) but the KS shop said they could price match. What do you think of the dress on me? Does this print placement look OK (they only have one in stock in my size)? Should I get it? I have it on hold. I'm pretty sure I can get it without spending any additional money, from the clothes I consigned recently plus the Ebates/Mr. Rebates rebate checks. I know I said I was on SYC but I really really hope DH will agree to make an exception for this, since I would be using my consignment/rebate money! Otherwise I can ask him if it can be my birthday present! 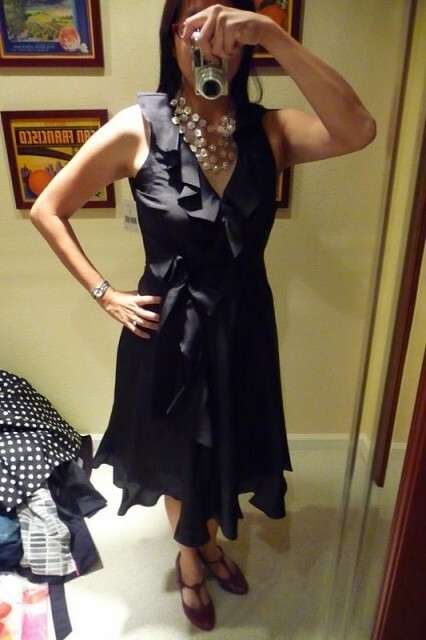 Also I could eBay my black Kate Spade ruffle wrap dress that I never wore (#4) if I don't have enough to cover it (I will check with the consignment store to see how much I have sold so far). Anyone have any tips for eBaying? If the original price was $395 and it's NWT, how much should I ask for and should I do an auction or Buy it Now? How much should I charge for shipping or should I do free shipping? I've never eBayed anything before, but I think for something like this I'd get more on eBay than consigning it. Thanks for your help! Why haven't you worn the black one? It great on you! As someone who had the conversation today in the car at the alterationist's to the tune of, "are we done dealing with pants here now?? ", I would communicate clearly on this one. Don't assume that your rebate/consignment money means "no buying" to the wary hubby. Just a heads up from someone in the same boat as you! CJH, I don't know why I haven't worn it. It was one of my first purchases after joining, but I haven't had an occasion to wear it (it's a little too fancy for work) and it doesn't seem to be as consistent with my current style. I would keep it if I can, but am also willing to sacrifice it if I need more money to cover the new dress. Agreed Mo, I don't want to make the same mistake again, this is dependent on the hubby understanding and agreeing to my "wardrobe math". Which is not a given but hopefully I can convince him! I would go on eBay and do some research. Look at some similar KS dresses. I'm only intermittently browsing eBay these days, but my impression was that if something, especially high-end designer, was NWT, the seller would attempt to get full price or something very close (at least that's how I remember it, from the buyer's side--thinking how overpriced stuff was on eBay). However, does that mean that they actually were able to get that price? I don't know. If nothing else, you'd get an idea of whether people were bidding or not. No bids at all, or a huge spread between top bid and asking price, would obviously be a bad sign. Mochi, actually I got it half off at a sample sale so I'm hoping if I can sell it for half price I would break even and it would then cover the cost of the new dress. But you're right, I may not mention the old dress if I don't have to! I will have to put out some feelers first! I don't know . . . I have a black strapless Shelli Segal Laundry dress with the tags that were marked down to $89 from a much higher number and I've had no luck selling it at a start of $19.99 and Buy it Now of $30. Listed it at least 9 times now. This dress is gorgeous on you, Natalie. Just stunning! And I can tell you love it. Well, who wouldn't? And I agree it seems more suited to your current style than the earlier black one, which is also lovely, by the way. But I would discuss this with your husband first. This may be a perfect opportunity for the two of you to figure a few things out and find a way of communicating about this subject that won't leave either of you feeling resentful. To me it feels as if it will be important to position yourself as a responsible adult in this conversation, not as a child who is begging a favour. You earn a good income and you want to spend some of it on clothes; perhaps, just as the black ruffled dress is no longer consistent with your style goals, the idea of not shopping is inconsistent with the way you want to live, too. Maybe he needs to hear a possible alternative, a budget you'd agree on, whatever. Does that make sense? There will always be another beautiful dress and you have so many gorgeous clothes. Too me it didn't sound like your husbands problem was weather or not you could afford more clothes or not it was more a question of what does a person need. of couse if your husband agrees with your wardrobe math then it is a non issue- I still believe it would be in your best interest to have a conversation of wardrobe budget and then you wouldn't have to worry. I would gently say let YLF help talk you out of this one GP. And he might wonder why you are doing window shopping if you are on SYC? Just a thought for you to consider. How soon is your birthday? My DH is hesitant to agree to gifts like these beyond a few weeks before a birthday/Christmas because it is too easy to double dip so to speak. I think the discussion of a budget - maybe for each of your hobbies - might be better. Even if you end up paying a few dollars more for the dress in a few weeks, talk to DH honestly first. Do you NEED another dress? Will it add versatility to your wardrobe? If it is just want and not need and it won't fill a hole, perhaps it would be better to pass. You look fabulous in almost everything you try so you won't have trouble finding another beautiful dress if you ever do NEED one. That is a beautiful dress and I think you would wear it more than the other one. However, based on what you have written about your relationship with your husband, I do not think your approach to purchasing it will work. "Honey, I saw this dress and it's so beautiful. I really want to try it on. Please come with me! I know you're upset about my shopping, and that's why I want you to come with me and tell me what you think." "I know you're worried about that, and I'm consigned some things to make up the difference. It would mean a lot to me if you went with me, even if it turns out you hate the dress or don't think we should buy it." "Oh. Well, I guess I understand. I just wanted to include you, because in my head I was so beautiful in this dress." "I've been trying really hard to be mindful, but this dress just grabbed me. I really want to know what you think." There will ALWAYS be another beautiful dress. I think you need to take a deep breath and walk away. Your husband seems to have an issue with wardrobe spending, and perhaps he senses an element of impetuousness that concerns him. As someone earlier pointed out, he may be wondering about why you are continuing to shop (not just window shop, you actually have the dress on hold) while you are on SYC. It is a gorgeous dress and it looks fabulous on you. Truly. I have learned the hard way that there is always something new to fall in love with... I thought I was done with bags and boots, but in reality, I am never done with bags and boots. I'm in the same boat for financial reasons (self-employed $ fluctuations! ), so I'm both you and your husband at once! I would pass for the sake of your marriage. It will be a good test of your willpower, and honestly maybe what you should share with your husband is how much you adored this dress but chose to leave it behind in honor of your recent discussions. Otherwise, he may just think you're perfectly good with the current situation forever. For that reason, I do think he needs to know that it's not just a matter of you no longer wanting new items, (because eventually you are going to need and want to shop for real again), but rather taking your promises seriously. Natalie, you look absolutely beautiful in the dress. As you do in all of your clothes. I'm just wondering if it's too soon after the uncomfortable situation with DH to consider making a new purchase. You have so many gorgeous, beautiful, well fitting clothes and you had posted not long ago about many that you haven't even worn yet. Just saying. I just read Una's comments and I really think she has made an excellent point. Meanwhile, this speaks to the fact that you already have a wonderful wardrobe and closet from which to put together some truly fabulous ensembles. You look *great* and you have chosen nothing but the best pieces all along. You already have an incredible wardrobe - and you're now at the point where you can quietly and easily add just one or two pieces per season for the next little while. I guess I'm saying that you have a 'curated' closet and there really isn't much left to buy. Just a refresh here and there, and you can be judicious about the one or two odd pieces per season that you might add for say...the next year or two or even three. Your wardrobe is *that good*. That said, I quite like that black dress. If you don't wear it, then certainly you should find a way to get it out of your closet, but just the same - the closet is still still filled with fabulous pieces and you don't need to necessarily replace something that you might let go. I wouldn't let go of that black dress though - I think it's beautiful, but if it's just sitting there, languishing in your closet, then you're wise to pass it on. Love the black/white floral dress - it's gorgeous, and totally *you* - you have such great taste and a fabulous sense of style. At this point though, I'd pass on it only because you already have so many wonderful things to choose from. Know what? You are so good at this that I'd pick you for a fashion stylist if you lived in my city. Not kidding about that. Have you ever considered starting up a separate style blog? Just for fun? You'd be very, very good at it. Just an idea. What do you think? Everyone has made such great comments! I second everything Suz and Una said. I think this is a really good opportunity for you to have an important conversation with your husband. GP, in an earlier post you mentioned your actions have caused hubby not to trust you. And now you are on SYC but talking about purchasing a new dress. Regardless of the rationale (using ebates, consignment money etc) this reads as you being unable to keep your word. Please don't think I am being harsh, but I understand how this type of inconsistency could be difficult for your hubby. There will always be a dress we just have to have but good relationships can be far and few between. Stick to what you have committed to and let the dress go. Thanks everyone for the sage advice! I know you guys think I'm totally silly or unreliable for shopping while supposedly on SYC. I've been eyeing this dress for a while and was planning to wait for this dress to go on sale. I was thinking that by the time I was done SYC that it would hopefully be on sale by then. I just didn't expect to find it on sale this week, and with the extra friends & family discount code I felt like I should pounce on this while I can. I felt comfortable approaching DH because he told me a couple of days ago that he wasn't mad at me anymore. I think he was mainly upset about me hiding things from him, not the amount of money itself. So I figured I would just be honest with him and see what he said. Also I had recently told him about my extra income (which means I am getting a raise this year), so he wasn't as stressed about money. Also he's been in a better mood the past couple of days and we were just talking about his diving trip this coming summer (he's going to go diving by himself for a week and I'm going to watch the kids). So I figured now would be a good time to talk! Me: "Can I ask you a question?" Me: "I consigned a bunch of my old clothes. Can I use the money from that and my rebates..."
Me: "Yes, I want to buy a new dress. Can I do that as long as I don't spend more than the money I earned?" DH: "Sure, I guess that only seems fair." Yay, I can't believe it was that easy! So now I have $94 from ebates and $83 from Mr. Rebates and whatever I made on the consignments (will check with them), which should be enough to cover the dress! So excited! And the black ruffled dress is safe for now--I will either decide to wear it, or else put it up on eBay later. Even though I am planning to buy this dress, I HAVE slowed my shopping way down (you guys probably can't tell, but it's true!). I know I have a fab wardrobe and it's pretty full, so there isn't much that I'm planning to get in the future. I am planning to discuss SYC/SYB with DH and negotiate a "hobby" budget at some point, but for now I'll take what I can get--I'm just glad we had a rational conversation and came to an agreement so easily! Thanks for your advice! VC, you are so sweet! I do have my YLF "blog". I think I'd have to get better at my outfit photography or enlist DH if I were to have a "real" fashion blog, and I'm not sure if I have the time right now (and don't want to aggravate DH!). I would love to be a stylist someday, like Claire does for Dress For Success. Maybe when the kids are a little older and don't take up so much of my time I can look into volunteering. I've actually never shopped for anyone else (other than my kids), so I'm not sure how good I would be at it--but it would be a lot of fun to try! ETA: Saw your update after I posted, so I'll shut up now! Glad it worked out so well. Okay, Deborah touched on something I was afraid to mention but now will. I hope I won't offend you somehow. If I do, let me know and I'll delete this post. Do you feel your relationship with your husband IS in good shape? That may be an underlying issue, and it's difficult to know cause and effect sometimes (as you know from being a physician!). This whole wardrobe budgeting issue could be the cause of strife, or it could be the result of some deeper, underlying differences. Your husband's wishes and needs are important and worthwhile. At the same time, are you being stifled or made to feel bad without cause? Or is he seeing something that you may need to acknowledge more seriously? I know my husband often calls me out, but most of the time, I know it's well-deserved. For example, when I rant about our kid not keeping his room neat, he will point out that I never ever make the bed myself. He knows me inside-out. Plus we have equal earning power and "hand" (to use a Seinfeld-ism) in our relationship. Obviously I don't know the answers. And I do not want to intrude or make any presumptions about your marriage and life. But I've had these concerns for you and would feel remiss if I didn't voice them with great love and your best interests in mind. This is good news Natalie! I'm so glad you were forthright with DH and that things are cleared up between the two of you. You still need him around to appreciate how fab you look, after all! FWIW, I love the new dress you are considering, and I would trade the ruffled black dress to get it, if that's what it takes. Better to have fewer items you really love than a lot of iffy ones in your wardrobe. It must be hard to slow down your purchasing because you were on SUCH a roll, but we'll still love you and enjoy looking at your outfits even when they don't contain a new item. Promise! Come on over to the budget side of dressing; the water's fine! "I felt comfortable approaching DH because he told me a couple of days ago that he wasn't mad at me anymore. I think he was mainly upset about me hiding things from him, not the amount of money itself. So I figured I would just be honest with him and see what he said. " Personally, I think this is really good news! It sounds like you two are coming to an understanding about the whole thing, and knowing that it's not just about money is helpful. I can't help but wonder if it's you who feels funny about shopping, given that you went years and years without really buying yourself anything, and maybe your husband is picking up on this? I know it sounds kind of off-beat and out-there, but still - you didn't buy much of anything for yourself for years on end, and then you played catch-up in a short period of time, and I'm wondering if there's a possibility that you feel guilty about this and as a result, you might be giving off some "I feel weird about this" vibes, somehow? Is this within the realm of possibility? That maybe your husband really doesn't mind all that much, but perhaps because you went so long without buying things for yourself that when you did decide to revamp everything, you felt a bit funny about it? Is this possible? Is your husband only 'mad' because he's picking up on your own vibes about this being quite a bit different than the past few years? How do you feel about your style and wardrobe transformation? As I said before, I think you have a great sense of style and I also think you look just fabulous. In the meantime, there's been some talk and focus on what your husband thinks of these changes - but what do you think? Do you feel confident and do you feel like you have your feet on the ground in terms of the changes you're making and the things you've been buying? VC, very insightful comments. Objectively, yes my fashion journey has been super crazy, right? Nothing for years and then complete wardrobe and style change? No wonder DH is suffering from whiplash--it's like a total overnight transformation! He was worried my whole personality was changing and that I was becoming obsessed or addicted. I agree I did do a ton of shopping. But hopefully I won't need to spend so much time or money on it in the future, now that I've got things down. And I'm still the same me underneath the fancy duds. I do feel good about where I am now, the completeness of my wardrobe, what I've learned and how my style has evolved. I feel much more confident in myself, and am having fun exploring my creative side which has not been very well developed before (I am terrible at art!). So yes, I feel really great about my style journey, as crazy as it has been! I really feel like I'm hitting my stride! And I have Angie and all of you to thank for helping me along! GP, that dress was spectacular on you, so I'm especially happy this story had a happy ending. I'd still like to second Una, Suz and Christieanne's suggestions that you continue to talk about this, and make sure you do it not in an 'exception this once' way but in terms of setting out sustainable spending/shopping patterns that are agreeable for both of you. Congratulations on a love of a fashion find, meanwhile! So anyway, everyone's brought up great things to think about. I had wanted to add that I also remember your daughter, who's all of four years old, recently telling you you had too many clothes or you shop too much or something to that effect? I don't know what was going on with that, but it struck me as a funny thing for a kid to say (and I know kids DO say funny things...) but it also could be not only a money but a time-spent-on-shopping issue? Just a thought. And the unfortunate truth is that there are always going to be more and new and shinier and prettier new things coming down the fashion assembly line each season...I did like the KS dress you are now eyeing, and if your husband's cool with it, glad you're going to have it...it didn't seem to be the be-all-end-all little black dress type of crucial dress to own, especially seeing as you have beautiful items in your closet you haven't worn yet. But all these things, I think you're now thinking about, having been honest and brave enough to bring them to the table here. Just wanted to add that I hope you start to really enjoy wearing the gorgeous clothes you already DO own. You have quite a collection, an amazing wardrobe! Good luck with consigning, also! Hitting this thread late but boy does it hit home! First of all congratulations on having a really adult conversation with your hubs. I find men do best with really straightforward non-whining conversations. Second, like you I didn't buy much clothing for YEARS! Suddenly I find YLF and the UPS man is making many trips to my house. I still laugh at how Una wrote that thread about the other man in her life (the UPS man). My hubby thinks my interest is fashion is trivial. He doesn't understand my participation on the forum but we have agreed to disagree. He has his hobbies and I have mine. I do agree that with as lovely a wardrobe as you possess, you didn't really "need" the dress and it might have been a terrific test of willpower to resist but eventually you would have to have had this conversation with your husband regarding clothing and you did it in a straightforward way! Natalie - I am totally feeling like this right now too. I want to say, put the dress down and walk away but that would be hypocritical. I sent back my dotty wallet due to quality issues, and now I am shopping around for a new one when I should probably just keep using my perfectly normal acceptable wallet for now. I am planning to spend some quality time in my closet this weekend pruning some old hold outs and putting some of my new fab clothes into rotation. Of course I want every new thing out there (hello, green blazer, I'm looking at you! ), but my closet is already full of new, nice, trendy clothes that deserve to see the light of day. Sounds like some SYC therapy may be in order. lol. Both dresses look lovely on you.